A very welcome article in the Observer reveals that Ministers are due to announce a crackdown on nuisance phone calls by firms and charities this week, with some rogue companies set to face fines worth many hundreds of thousands of pounds. The government, on the advice of the Information Commissioner's Office (ICO), the regulator responsible for unsolicited marketing calls, wants action to be taken where "nuisance, annoyance, inconvenience, anxiety" are caused – even if a person receives just one call, but others report receiving similar calls. Miller said: "Nuisance calls must stop. At best they are an irritation and an unwanted intrusion; at worst they cause real distress and fear, particularly to the elderly or housebound. People need to feel safe and secure in their homes. The rules are clear – people have the right to choose not to receive unsolicited marketing calls. We will work to ensure their choice is respected." There were 120,310 complaints made between April and November 2013 to the ICO. In January this year, there were also 2,507 complaints about silent and abandoned calls made to Ofcom, which is the regulator responsible for those calls. Justice secretary Chris Grayling will also unveil plans to impose fines of hundreds of thousands of pounds on claims management companies that use information gathered by unsolicited calls and texts and other unwelcome practices. Grayling will launch a consultation on whether firms should face fines of up to 20% of their annual turnover for offences including using information gathered by unsolicited calls and texts, providing bad services or wasting time and money by making spurious or unsubstantiated claims. When even registering with the Telephone Preference Service does not seem to deter this callers, this action is much needed. I know that opposition politicians are always putting in FOI requests and demanding explanations for trifling amounts of expenditure but even I was taken aback by this latest example from Labour-led Neath Port Talbot Council. They have adopted a plan to swap all the household wheelie bins in their area for smaller ones in the hope of reducing the amount of waste going to landfill. The Council report recommending the switch reveals that the total cost will be £730,000. It suggests that this will encourage local residents to recycle and compost more. This scheme is barmy, a complete waste of £730,000 of the public’s money, and comes at a time when the council is planning to cut a host of other important services which will impact upon local communities. If the council go through with this, over 45,000 households will lose their large 240 litre bin, and see it replaced with one which is over 40% smaller at 140 litres. All that will happen is more fly-tipping, and litter which the council will have to spend money clearing up. Nobody is arguing about the need to put up recycling, but Neath Port Talbot’s approach is all compulsion, and no carrot. I am sure that they could spend this money in a different way to achieve their objective. What is worse is that Labour are spending this £730,000 on replacing wheelie-bins at a time when they are planning deep cuts that will affect the lives of local people and levying a council tax that is higher than that in neighbouring Welsh authorities, the second highest in Wales in fact. For instance, this amount of money could mean no cuts for early years development, and subsidised bus routes; no cuts for community meals, and no need to slap charges on those residents using the council’s day services. It could also mean no cut in the amount spent on gully cleaning and land drainage which given the amount of rain we have had would seem to make good sense. From the Council that had a waste incinerator built that was rarely used and which has now been mothballed this is another example of an idea that should never have left the drawing board. This is a very short rant about Welsh Labour's tactics of seeking to deflect perfectly legitimate attacks on their record by alleging that their opponents are waging a war on Wales. It is certainly the case that some of the more unsavoury UK media have crossed a line in their portrayal of our country and I am one of the first to condemn them for it. However, that does not insulate Carwyn Jones' government from answering for its policy and delivery failures. Welsh Labour Ministers have been very vocal in knocking the record of the UK Coalition. Did they really think they would not get attacked back, in spades? It is a form of karma they have to live with. However, there is a wider dimension to this. Many of us have invested a lot of time and effort into establishing a proper parliamentary system in Wales where there a clear division between the Executive (the Welsh Government) and the Parliament that scrutinises it (the Assembly). In identifying their own interests with that of Wales, Labour are once more muddying those waters. The policy failures are those of a Welsh Labour Cabinet, not of the Assembly or the Welsh people. Labour need to step up to the mark and take responsibility for their own record instead of deflecting it onto others. Today's Scotsman adds further to the case against Scotland voting 'yes' in September with the claim that European Commission officials have declared there will be no change in the rules governing cross-border pension schemes. They add that single-country pensions have the flexibility to go into deficit as long as they are able to continue making payments to members of their schemes and there is a long-term plan to get out of the red. That does not apply to cross-border schemes, which must be 'fully-funded'. Yesterday’s ruling means that if Scotland becomes independent, firms would have to ensure pension funds for workers north of the Border were “fully funded” because they would count as cross-border schemes. David Wood, executive director of the Institute of Chartered Accountants of Scotland, said it had been estimated there were some 6,300 defined-benefits schemes in the UK, of which about 5,000 were in deficit. The total deficit, he said, was about £300bn. Assuming three-quarters of these pension schemes were across England and Scotland and would have to be redefined as “cross-border” ones after independence, that would leave a gap of £225bn that would have to be plugged by companies. “We are talking about huge figures,” Mr Wood said. “Any requirement to make good that deficit before independence in March 2016 would impose a real crisis for some employers and could put some companies at risk. Concern was also expressed by the National Association of Pension Funds, which represents 1,300 pension schemes and assets of £900bn. Chief executive Joanne Segars said the announcement had “major implications for pension schemes as part of the debate on independence for Scotland”. The fact that the European Commission has not changed the rules as expected is seen as a massive blow for the independence campaign. Today's Times carries a report in which the Communities Secretary, Eric Pickles seeks to attack the Welsh Labour Government for not imposing the sort of draconian controls on local government that he has implemented in England. Over the border, Councils are offered a financial incentive not to raise their council tax and are told that if they want to increase it by 2% or more they need to hold an expensive referendum. Now, I want to reduce bills as much as anybody but in my view the best way to do that is through local accountability. Philosophically, I have no problem with the government incentivising councils if it wishes, but I do have a problem with ministers restricting local councils' room for manoeurvre through top-down directives that bypass local decision-making. I have an even bigger problem with an English Minister telling Wales how to spend its money. That is not his job and even he must realise that (a) council tax remains lower in Wales than in England and (b) council tax is not set by Welsh Ministers, it is set by Councillors who, it must be said, still have a lot to answer for with the burdens they impose on electors and for which they are accountable through local elections. The ongoing row about the Government's ban on relatives sending books to prisoners is a classic case of how a perfectly reasonable measure is distorted out of all proportion and then misrepresented so as to provide a stick to hit Ministers over the head with. What is particularly sad is that some Liberal Democrats have fallen for the hype and jumped on the bandwagon. Reading this Telegraph article, it seems that the facts are very different to the narrative, which a number of prominent authors are signing up to. Firstly, prisoners have not been banned from accessing books. Prisoners continue to have access to prison libraries and can have up to 12 books in their cell at any one time. They can also order books they wish to read and of course relatives can continue to donate books to the prison library. Prisoners also continue to have access to classes where they can acquire skills and qualifications. Secondly, there has not been a specific ban on sending book to prisoners, instead the ban, which has been in force since November last year, is on family packages. These packages often contain food, sports gear and occasionally books but also are used to smuggle in contraband and drugs. Michael Spurr, the chief executive of the National Offender Management Service has compared the inventiveness of inmates to that of the Great Escape including using hollowed out Weetabix packs to hide mobile phones and having drugs and phones hidden in shoes, clothing and stereos. Books have also been used to smuggle in drugs. As the Secretary of State for Justice says: "The idea that we are banning access to books for prisoners is just nonsense. We work extremely hard to keep drugs, extremist literature and other banned material out of prisons. Suggesting that we should suddenly start allowing people to send unlimited numbers of parcels into prisons, that might contain books or otherwise, is the surest way of seeing the amount of contraband getting in go through the roof." It is about time that some persepective was brought to this debate adn i am glad that the government have sought to do so. The Times reports that Ed Miliband has been urged to stop dithering over the next Labour manifesto amid growing fears that he may duck radical measures and adopt a safety-first approach to next year’s election. Mr Cruddas is pushing the party to promise a wider reorganisation that would strip Whitehall’s responsibilities for these areas and hand power to local councils. There are growing fears that many of the plans will be blocked by Mr Alexander, who is urging caution. The issue has been given fresh urgency by a tightening in the polls, three of which put Labour’s lead at one point while a fourth, ComRes for The Independent, saw a fall from 8 to 5 points. Mr Miliband’s office is also blamed for dampening the leader’s personal enthusiasm for radical change, with some arguing that there is little need to risk the remaining poll lead. Mr Cruddas has forged a significant series of alliances from the right and left of the party, teaming up with Lord Adonis, the former Blairite transport secretary, who is holding a growth review, and Chuka Umunna, the Shadow Business Secretary. Yesterday their agenda was backed publicly by 19 leading figures from groups including the Fabian Society, Compass, the Policy Network and Progress. They said they were uneasy at the prospect of Mr Miliband going into the election without a radical programme of change. “If Labour plays the next election safe and hopes to win on the basis of Tory unpopularity, it will not have earned a mandate for such change,” their letter said. One signatory confirmed that the letter is designed to boost Mr Cruddas against “forces of conservatism” in the Labour Party that are trying to hold him back. This suggests that there will be uproar from across the Labour movement if he avoids Mr Cruddas’s prescriptions for change. Presumably we will get much more of this sort of negative briefing by Labour insiders as we get closer to the General Electon and Labour continue to struggle to make any impact in the polls. With Labour apparently shocked into silence on the budget, the Telegraph nails precisely why the Liberal Democrats should be proud of their influence on government. Conservatives often praise Nick Clegg’s closest ally as a natural Tory. His Lib Dem colleagues sometimes complain that he has gone native and become Mr Osborne’s useful idiot, helping to implement Tory policies. “If I let insults and jibes bother me I’d have long since abandoned this office,” he laughs. He replies that the number of Lib Dem ideas being implemented by the Treasury suggest it is Mr Osborne who has gone yellow, a proposition quite a few Tories would agree with. They are different politicians from “very different backgrounds”, he says, “but we both have a shared wish to do the right thing for the British economy”. They both shaped the Budget, even if Mr Osborne gets most of the credit. “I really believe the economy would not be recovering if it was not for the Lib Dems.” Every aspect of government economic policy he attributes to his party’s influence on the Coalition. He just needs to “tell people much more vigorously and directly the difference that we Lib Dems are making.” Take the increase in the personal allowance. He and Mr Clegg argued months ago for it to be raised even further than £10,000, to £10,500. The idea it was a Tory idea, as Mr Osborne has tried to imply, “is just nonsense”. Suggesting that the Tories dance to a Lib Dem tune will not endear Mr Alexander to his Coalition partners. But his point is that raising the personal allowance was a specifically Lib Dem policy, one of its conditions for agreeing to the Coalition in 2010. “We forced that idea on to the agenda. No one was really talking about thresholds before we made it a key promise in 2010.” He says that whereas the Lib Dems are focused on the allowance, the Tories appear to have different priorities on tax, from inheritance tax to the 40p higher rate. Yet he reveals there was no attempt by Mr Osborne to raise the issue of the 40p rate in the Budget negotiations. Despite all the pressure from some Tory MPs, “there’s never been a specific idea put forward to really do something about the 40p rate,” he says. Coalition works and it is the Liberal Democrats who are making it work so as to deliver a stronger economy and a fairer society. 1. Growth is up, unemployment down and inflation down. Labour are accusing us of a “millionaires’ tax cut”, but when they were in government they argued consistently that any increase in the top rate of tax above 40% would be counterproductive and damaging to the economy. 2. Under Labour the total bankers’ bonus pool was something in the order of £11.3 billion, and it was £11.5 billion the following year when the Labour Government brought in a bankers’ bonus tax. According to the Centre for Economics and Business Research, the bankers’ bonus pool was £1.6 billion last year. In the current year, it is estimated to be £1.3 billion. That is one-tenth of the size of the bonus pool on which the original tax was placed. So how are Labour going to get £3 billion in tax out of a £1.5 billion bonus pool? 3. The immediate after-effects of the banking collapse were to reduce output in this country by 7.5%, which is more than in the great depression. Not surprisingly, that has affected living standards in a radical way. It has impaired our capacity to recover from the damage inflicted on the banking system. 4. We now have the lowest unemployment of any major country except Germany—lower than France and Sweden. We are now seeing the success of employment policy in the fact that we have had an enormous growth in employment, with 1.25 million net of public sector job losses and a gross increase of 1.75 million. Roughly five private sector jobs have been created for every one lost in the public sector. These are predominantly, in fact overwhelmingly, full-time jobs. Labour’s argument has been, “Well, okay, there are lots of jobs but they are part time,” but last year, in 2013, there were 460,000 new jobs, of which 430,000—95%—were full-time jobs. The total adult population in work, is now at its highest level ever—higher even than in the United States, which is famed for a flexible labour market. 5. Last year, overwhelmingly the largest number—well over 90%—of jobs went to British workers. 6. Youth unemployment is currently at about 20%, but that includes many full-time students. The key trend is that youth unemployment is now declining rapidly. It is certainly less now than the level we inherited, and we have a whole set of policies designed to deal with it in a systematic way. 7. Labour have put forward the idea of a youth guarantee. The problem that that presents is this: how can a job be guaranteed other than through the public sector? Of course guaranteeing a public sector job takes people off the dole, but it also creates a permanent need for subsidy and support. 8. The Government has created a route that allows people who are not going into full-time higher education to develop the preconditions for proper apprenticeships through traineeships, basic academic requirements and work experience, and then find their way into true apprenticeship training, which has been an enormous success: it has doubled since we came to office. The measures announced in the Budget statement yesterday will enable a further 100,000 people under 24 to be given apprenticeship training, and the quality improvements that we have made are driving up demand and supply at the same time. This is a much better way of dealing with young people who are out of work than creating artificial jobs. 10. The structural deficit has fallen from about 5.4% of GDP to 2.7%. We are nearly halfway, but we have to continue the job, and the next Government will have to continue the job. 12. The extension of investment allowances will substantially increase the incentives for small and medium-sized companies, particularly those in the manufacturing sector. 13. Tthe Government are establishing institutions, particularly the business bank, which are developing new flows and types of finance—internet-based lending, asset-based finance, invoice finance—in areas that hitherto were deficient, as well as supporting the establishment of new banks. About 20 new banks have been licensed over the last year, and that deals with the issue of bank competition that should have been dealt with when the last Government were in power and we had the Cruickshank report. The net lending trend should become much more positive, but there is no underestimating the enormous damage that was done to the British economy as a result of the collapse of the banks, over which the last Government had responsibility for many years yet did absolutely nothing. 14. In the period after 1997 we saw the share of the British economy accounted for by manufacturing shrink from 20% to 10%, a decline that was even more rapid than in the mid-1980s, when policies were considered to be unfriendly to manufacturing. We lost 1.6 million jobs in that period. 15. Help for energy intensive industries cannot be brought in immediately as we need to obtain state aid clearance from the European Commission. 16. The priority of the Government is manufacturing, investment and the savings that lie behind investment, and exports through the expansion of export credit so as to establish long-term growth and the productivity that that entails. 17. There are still serious constraints in terms of skilled labour. There are still problems in opening up business finance. We have to invest much more in science and innovation, although we are doing that. However, the themes that run through yesterday’s Budget of support for investment, for savings and for exports are absolutely right and they will take this country to the right place. A row that has rumbled on all week is over who pays for the electrification of the mainline from Cardiff to Swansea and the valleys lines. All of this blew up on Monday when the First Minister stood in front of his expensive lectern in Cathays Park and claimed that the UK Government were reneging in the deal they had made with Welsh Ministers. Carwyn Jones wrote to David Cameron last week saying that he was coming under pressure from Network Rail to confirm who was paying for the work and that he wanted urgent clarification from Downing Street. And in the answer from the PM, it emerged that the UK government is going to pay directly for the electrification from London to Cardiff, and then the stretch from Bridgend to Swansea. He says this was all part of the agreement reached in 2012. The more observant readers among you will notice that there's a gap between Cardiff and Bridgend. That gap between Bridgend and Cardiff and the Valleys lines are initially going to be paid for by Network Rail who will then recoup the money in the form of charges to the rail operating company which has the franchise, Arriva Trains Wales. As there's a substantial subsidy on that franchise paid for by the Welsh government, it appears that the money will ultimately have to come from Cardiff Bay. David Cameron's letter says: "It appears that a misunderstanding has arisen that the Valley Lines electrification will be directly funded by the UK government but that was never the case." In his letter, David Cameron says that while the UK government provides indirect financial backing to Network Rail, he does not state that the UK government will pay for the cost in the Valleys, totalling hundreds of millions of pounds. It seem that Labour's case is based on some interviews conducted iwth David Cameron in which he was very quick to claim the credit for the electrification going ahead with some typically imprecise language as we would normally get in that sort of discussion. However, the meat of the deal is in the exchange of letters between the two governments, which details what exactly Carwyn Jones and his administration have signed up to and which they are now seeking to back out of. The rest is second-rate political rhetoric on the part of Labour politicians. The next Wales and Borders franchise specification should include electric services on the Valleys lines, with a specific access charge on the franchise to repay the infrastructure investment by Network Rail...This will include electrification of the main line between Cardiff and Bridgend. On that basis, I will include electrification between Bridgend and Swansea’. Why is it suddenly a surprise to you when it was there in black and white in the business case that you wrote and the letters of offers that you exchanged between the two Governments that there might be a cost to the Welsh Government? It is as plain as the nose on your face. I gather the correspondence between officials continued and that that 'side agreement' was finalised and also documented. It adds to other correspondence which has been released in the last week which strongly suggests that there was a formal deal in which the Welsh Government agreed to meet the cost of electrifying the Valley Lines. That's certainly what Welsh Secretary David Jones believes and it's why he told me he expects Carwyn Jones' government to stick to its deal. The evidence then is that it is the Welsh Labour Government who are dissembling. They are playing politics with an important and substantial investment and putting the future of the Valleys in doubt. They are letting down South Wales. The extraordinary attack by the First Minister on the Labour MP for Cynon Valley, Ann Clwyd in last Tuesday's Plenary session of the Welsh Assembly was covered by the Times, who highlight some of the wider concerns about the health service here. The paper also report that it has emerged that the head of the Welsh health watchdog has raised concerns about her own inspectorate’s ability to pick up on a scandal like that at Stafford Hospital. Kate Chamberlain, the chief executive of Health Inspectorate Wales, told the health committee that she could not give “assurance” that it would detect a serious breakdown in healthcare and that it “cannot possibly be everywhere”. It seems that the First Minister prefers to attack the messenger instead of taking her message seriously. I had tickets to go and see the film Inside Llewyn Davis but unfortunately had to cry off due to attending a question and answer session with young people sponsored by Mencap. 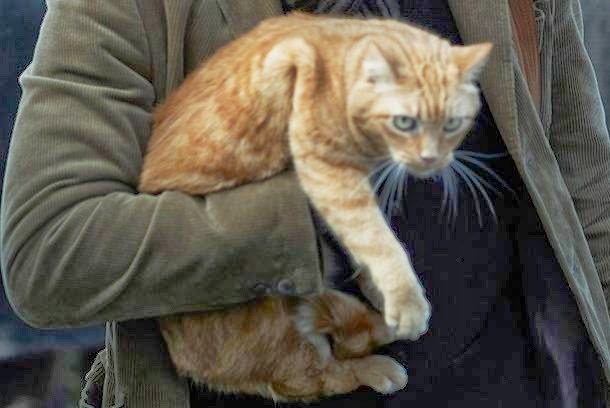 It was a worthwhile diversion and can catch the film another day, but would not want to miss this opportunity to highlight the film's real star, Ulysses, who is a ginger cat. The trailers I have seen for this film indicate that it has an annoying thread of mispronouncing the leading character's name as 'Loowin' when any self-respecting Welsh person knows differently. But back to the cat. One website reveals that Ulysses was in fact played by three separate cats: As Joel Coen explained at the Cannes Film Festival last May, “The film doesn’t really have a plot. That concerned us at one point; that’s why we threw the cat in.” Maybe the Cannes jury members were cat lovers; they awarded the film the festival’s 2013 Grand Prix prize. The person responsible for helping the Coens get shots of their talented but hapless hero dealing with a tabby prone to barrelling down fire escapes, breaking free in subway cars, running down city streets, and becoming Llewyn’s mate on a road trip (during which Roland Turner, a surly jazz musician played by John Goodman, lobs putdowns), was veteran animal trainer Dawn Barkan. You know her work: Her credits include Ace Ventura: Pet Detective, Runaway Bride, and Snow Dogs, and she’s the trainer — please don’t call her a “wrangler” (that’s for sheep and cows) — responsible for Mr. Jinx being able to use the toilet in Meet the Parents. The star of the film, Oscar Isaac, disclosed the animal had also proved something of a diva on set, once scratching him in the face. “That’s what happens when you tie a cat to you and run into a subway,” he added. It sounds as if he got off lightly. One of the problems of devolution is that you are not in control of your own destiny on a wide range of issues. That is particularly the case in Wales where our legislative powers are limited and we are still arguing about funding formulas and tax. In these circumstances it is wise to temper one's critcism of the UK Government, just in case one's own party should take a similar stance at a UK level and completely undermine one's position. With a few exceptions, Welsh Labour have not taken this advice. They have been quite partisan on reforming the Barnett formula, despite failing to do so themselves when in Government. Meanwhile the UK Labour Party have been remarkably quiet, failing to commit themselves to back the Welsh Party's policy position. That has not stopped the Scottish Labour Party moving to undermine Carwyn Jones and his Government. It has been noticeable that although Labour in Wales are committed to replacing the Barnett formula with a needs-based assessment, no such commitment has come from the top of the Labour Party – Ed Balls or Ed Miliband. One reason Wales is disadvantaged is that, over time, funding increases as a result of the formula tend to bring Welsh spending into line with the average across the UK – the so-called Barnett squeeze. This has not happened in recent years because funding has either been cut or stood still. The only commitment on Barnett has been to revisit the formula in the event of higher future spending re-introducing the squeeze. Because Scottish Labour have dug their heels in on this issue Carwyn Jones and his government have been left out on a limb. In truth it is a situation that every other UK party finds itself in as well, this means though that Labour can no longer pretend they are different. Reforming the Barnett formula has effectively been taken off the table for some time. If Wales wants fair funding now then we may be left only with political fixes of the kind that gave Scotland their fiscal advantage in the first place. We might have to find a way to get more money to Cardiff Bay without taking it off the Scots because that is the only way we will be able to get it through Westminster, where Scottish politicians and the Scottish political situation hold all the cards. The manifestos of all the UK political parties will make for very interesting reading in a year's time. Today's Western Mail reports that Welsh Conservative leader Andrew RT Davies could be facing a further damaging challenge to his authority as it emerged that moves are being made to seriously dilute his responsibility over policy. They say that senior party sources have told them that serious consideration is being given to a system whereby the leadership will need to gain approval from the party membership, or the Welsh party’s management board, before policies were formally adopted. They add that Mr Davies is understood to be have been told to bring the four sacked Members – Monmouth AM and former Business and Enterprise Committee chairman Nick Ramsay, North Wales AM Antoinette Sandbach, Aberconwy AM Janet Finch-Saunders and South Wales East AM Mohammad Asghar – back into the Shadow Cabinet, in similar positions to those they had before, before the Welsh Tory party conference next month. This is of course an interesting development concerning a Welsh Tory group that remains badly split, with official complaints being made by one member against another. However, it does raise a more fundamental question: what sort of political party allows its leader to set policy without reference to the membership? That sort of arrangement seems to me to be more dictatorial than democratic. If members have not questioned the set-up before then, why not? Clearly, there is need for some glasnost within the Welsh Conservative party. The Telegraph carries an interesting review of a new book that seeks to lift the veil on the murky world of lobbying. A Quiet Word: Lobbying, Crony Capitalism and Broken Politics in Britain by Tamasin Cave and Andy Rowell argues that there is an imbalance between the parent who wants a lollipop lady at the school gates and the chieftains of the £2 billion “influence industry” who use their contacts to advance the interests of profit-hungry corporations. Still, politicians, as Cave and Rowell suggest, are hopeless at stamping out improper lobbying – not least because lobbying is what politicians do after (or even during) their parliamentary careers. Both the Tories and Labour have a substantial roll call of those who regard themselves (explicitly, in the case of one former minister) as “cabs for hire”, ready to pull strings for those who pay for leverage. This spider’s web of collusion is impossible for the general public to unravel. As the authors point out, the Lobbying Bill currently before Parliament falls woefully short of transparency. Who, then, is to shine a light on the murky ways of lobbyists? Cave and Rowell provide some useful examples, but their account is short on depth and detail. Partly, the problem is the ambitious task they have set themselves. The pharmaceutical industry alone would merit a book of exploration, as would the petroleum multinationals, the nuclear lobby and the other giants this text seeks to slay. There are some good hits, as well as familiar stories, such as Shell’s record in the Niger Delta, which certainly bear repeating. If the book posits a Manichean world in which the struggle of good versus bad sometimes leaves little room for nuance, that is the fault and virtue of all polemics. The paper takes issue with the portrayal of the media, which they say is superficial. They argue that if lobbying is to become more transparent, the awkward, contrarian British media is far more likely to be a solution than a problem. They would say that wouldn't they? The fact is that for all the allegedly forensic scrutiny of the fourth estate, they have been no more successful at controlling the lobbying industry than the politicians. The book should be worth a read. For those of us who support the concept of a high speed rail link between London and the north of England, Vince Cable's plea in today's Independent to speed up the implementation of HS2 makes a great deal of sense. Mr Cable, Liberal Democrat MP for Twickenham, told The Observer: “Creating jobs outside London, and closing the gap between north and south, has been one of this Government's top priorities. “On every visit I make to the north of England, I've heard businesses and council leaders make a compelling case for getting to the north more quickly by accelerating parts of the HS2 build." He added: “That would ensure the economic benefits can be shared sooner by everyone around the country and deserves serious consideration by government." A report from HS2 chairman Sir David Higgins will be published on Monday and is expected to outline his plan for an accelerated construction timetable while reducing the cost of the £50 billion infrastructure project. The paper says that Sir David will issue an appeal to the main political parties to unite behind the scheme and is expected to recommend a completely new station at Euston - the site for the line's London terminus. He is also expected to recommend scrapping plans to link HS2 with HS1, the London to Kent coast Channel Tunnel high-speed line. Every political party needs discipline. some though exercise it more liberally than others and not always appropriately. In many ways the Plaid Cymru leader had little choice in taking action against Dafydd Elis Thomas as he topped off a nightmare party conference weekend for her by directly and publicly contradicting a key part of her speech. However, the Plaid Cymru peer does have a valid point in arguing that |Assembly committee chairs should have an element of protection from such considerations to enable them to do their job. In previous Assemblies we have seen members removed from commitees by the ruling party or parties so as to prevent them scrutinising too closely specific items of legislation. In this Assembly, Labour moved committee chairs around to preempt a rebellion on the social services bill over smacking children, the Tories sacked their committee chair because he abstained in a key vote and now Plaid Cymru have removed Dafydd Elis Thomas as Chair of the Sustainability Committee for internal party reasons. He said he would consider over the weekend challenging a motion to replace him as chair of the environment committee. "It would give us an opportunity to raise the issue in public and explain to the people of Wales that AMs are more gagged and have less of a democratic scrutiny within their party system than happens even in Westminster," he said. His remarks have attracted support from others. The Labour AM for Pontypridd, Mick Antoniw said the committees needed to be "independent of political party influence" and that Plaid Cymru's decision to remove Lord Elis-Thomas as chair was damaging to the committee. Conservative AM Antoinette Sandbach agreed that "it should not be in the gift of political parties to choose committee chairs". The North Wales representative added the assembly had "lessons to learn here from Westminster" where committee chairs were elected by backbenchers. Ms Sandbach said Lord Elis-Thomas's years of knowledge gathered as chairman had been lost and was not "easily replaceable". "Politically, I didn't always see eye-to-eye with Dafydd Elis-Thomas but I do think he has been a good chair," she said. Liberal Democrat AM William Powell said he was disappointed with Plaid Cymru's decision to try and remove him as chair adding that Lord Elis-Thomas was a "distinguished, fiercely independent" chair of the committee. I agree with them but find it difficult to see how any system can be completely immune from party political considerations. Part of the problem is the size of the Assembly and the party groups, which means that members often combine the role of chair with a spokespersonship. In other words they cannot remain above the party political fray in the same way as they do at Westminster. In media terms too, Wales is a very small place and dissent of any kind attracts disproportionate attention, putting party leaders in a difficult position. And of course it is very easy to criticise the dsciplinary actions of other parties, not so straightforward when it is your own leader calling the shots. Today's Western Mail reports on the continuing saga of Wales' poor English Language GCSE results. The paper presents a dossier of evidence compiled by headteachers at more than 100 schools evidencing the impact of the new marking system on pupils and teachers.. They say that headteachers’ union ASCL Cymru have reported that schools across Wales are “at a loss” as to what to do after a sudden and unexplained dip in January’s GCSE English language grades, which had left experienced staff questioning their ability to teach. It said pupils and teachers had been left in tears by their GCSE English language results - and some schools had employed tactics normally associated with pupil bereavement to soften the blow. The union has taken representation from more than 100 secondary schools, which includes four independent schools and others deemed by education watchdog Estyn to be “sector-leading”. One headteacher said they were “deeply concerned” after their school’s A*-C pass rate fell woefully short of expectations, from a predicted 56% to just 31%. They said recent developments had made forward-planning “impossible” and called for a swift resolution to a problem that threatens to spiral out of control. They added: “As someone with long experience examining with the WJEC (exam board), I am greatly concerned that the system is now becoming increasingly unreliable. I have already been asked for predictions about the summer and this is an impossible task. What is most bizarre however is the aggressive and ill-judged response of the education minister to theses concerns, in particular a letter sent to him and endorsed by all Rhondda Cynon Taf’s 19 secondary schools, which suggested parents and pupils are “gradually losing faith in a once-reliable examination system”. The letter calls on the Welsh Government to allow pupils to re-sit the English language exam in the summer free of charge. In contrast it seems that the person jumping to conclusions here is the Minister. These are professionals expressing genuine and evidenced concerns. To dismiss their letter so strongly and in such terms shows poor political judgement and a crass disregard for the review process he has set in place, which he appears to have pre-empted. If the education minister is incapable of listening to teachers in a respectful manner then he is clearly in the wrong job. The continuing controversy over the increasingly unsustainable independence proposals being put forward by the SNP Government in Scotland have been set alight again today with an unlikely intervention from one of the World's leading businessmen, George Soros. The Telegraph reports that Mr. Soros believes that Alex Salmond's proposal for an independent Scotland to share the pound is impossible. He has also warned that starting a new currency would be "potentially dangerous" as speculators would sense weakness and launch attacks. The First Minister insists that Scotland will keep the pound in a currency union after independence, adding that Westminster will agree to the deal because it is in the best interests of British business. However George Osborne, the Chancellor, and his opposite numbers in Labour and the Liberal Democrats have categorically ruled out formally sharing the pound because it would be unstable economically and unpalatable to the electorate. Mr Soros appeared to endorse the latter position on Wednesday during an appearance at the European Council on Foreign Relations in London. He said: "Scotland wants to remain a part of the [pound] sterling and Britain is creating obstructions to that. It would be a very difficult relationship and I don't think that Scotland becoming independent and yet remaining part of the sterling is actually possible." The 83-year-old also said creating a new currency would be "very inefficient and potentially dangerous" because its weakness could trigger attacks on the open market. His comments suggest three of the four currency options for an independent Scotland - joining a currency union, staring a new currency or keeping the pound unilaterally - could not work economically. That would leave Scotland having to adopt the Euro - a reality that could face public opposition given the financial meltdown that swept through the eurozone in recent years. Coming from a world leading expert on currency these are views that need to bee taken very seriously. Today's Times spills the beans on the UKIP candidate approval process and the test that has failed to help the party weed out the more extreme 'fruitcakes' as the paper describes them. One councillor who applied to be an MEP was rejected on the basis of the test, which was used as part of a wider assessment process by the party. However, he later discovered that he had scored 99 per cent overall, with high marks for empathy, well-being, independence and optimism. He believes that he was a victim of a “stitch-up” by Mr Farage. A friend in the party told him that he was clearly “too sane to be a Ukip MEP”. There is still scope for embarrassment, though. The bestselling children’s writer G. P. Taylor — author of the Shadowmancer series — joined Ukip, giving money and standing as a councillor, but left last year because he felt uncomfortable with the members. “I met quite a few and I decided they weren’t the type of people I wanted to be around,” he said. “There was one guy who looked like a character in ’Allo ’Allo!, with a trilby and a leather coat. Last week Donna Edmunds, a Ukip councillor who is standing for the European Parliament, was criticised after claiming that businesses should be allowed to refuse service to women, gay or black people. There was controversy over the party’s former Commonwealth spokesman, who had been jailed for his role in a kidnapping gang in Pakistan. A prospective MEP, Shneur Odze, refused to shake women’s hands, claiming that his Orthodox Judaism forbade contact with women other than his wife. Pearlette Hopkins, who is standing as a councillor in Bristol, arrived from Jamaica in 2001 and is now a UK resident but has yet to become a citizen. “It’s so expensive to become one,” she says. He said that sexual harassment allegations were also “absurd”. “How can you have sexual harassment if men and women are equal? If someone touches your leg, you ask them to move their hand.” He also criticised working mothers, saying that they should stay at home for their children. To use a fairly hackneyed phrase, you could not make it up. Fatal Attraction and the 'bunny boiler' that nearly wasn't. Today's Guardian contains a fascinating retrospective on the 1980s classic film Fatal Attraction by the film's author James Dearden, and why the stage version portrays the Glenn Close character more favourably. The movie actually spawned an expression, "bunny-boiler", to describe a certain kind of vengeful, unhinged female. This has since gone into the lexicon – a dubious honour, but an honour nonetheless, I suppose. In fact, I originally wanted Alex Forrest, played by Glenn Close, to grill the unfortunate rabbit on a rotisserie. Somehow, I don't think "bunny-broiler" has quite the same ring. Mr. Dearden reveals that Glenn Close strongly resisted the rewrite, brought on by test screenings, in which her character is 'blown-away' in the bathroom of the family home. It was an ending that generated $300m for the film worldwide. It appears that this injustice, meted out to 'a lonely and desperate woman', may well be put right on stage. Picking up on David Cameron accidentally starting a meme on Wednesday when when he tweeted a picture of himself looking extremely serious on the phone to Barack Obama, the Guardian features the top five political twitter gaffes. Amongst those tweets are Ed Balls now infamous tweeting of his name that has led to the creation of an Ed Balls Day and George Osborne posting a picture of himself scoffing a late-night takeaway the day before the comprehensive spending review. Except that it soon transpired his burger wasn’t from some any old takeaway, it was actually a posh burger from upmarket chain Byron Burger. In a subsequent tweet, he added: “Thank God the athletes have arrived! Now we can move on from leftie multicultural crap.” Not the best move while the rest of Twitter was going wild for Danny Boyle’s celebration of all things British. Burley told the BBC the tweets had been misunderstood. Typos are par for the course on Twitter, of course. Except when the leader of the opposition makes a rather unfortunate one after the death of a high-profile figure. Ed Miliband made his mistake in an attempt to express sadness at the death of gameshow host Bob Holness, of Blockbusters fame. “Sad to hear Bob Holness has died. A generation will remember him fondly from Blackbusters,” read the hastily-deleted tweet. It didn’t help Miliband had only just given Diane Abbott a right telling off for her own social media mishap. i am sure there will be more in due course. Just when I thought UKIP could not get any more extreme, this report in one of our valuable local newspapers crosses my path. Responding to a post on an internet forum Coun Edmunds said they should be allowed to refuse service, including because a customer is gay or a woman. She had been asked to state whether she supported remarks by Henley-on-Thames UKIP councillor David Silvester who said the floods this winter had been caused by the Government’s support for gay marriage. After saying she did not agree with her party colleague, she added: “I believe that all business owners, Christian, Muslim, gay, straight, should be allowed to withhold their services from whomever that choose whenever they choose. When asked by The Argus to clarify her statement the EU election hopeful said it would be ok for a shop owner to refuse to serve her based on no other fact than she was a woman, or if service was refused to a gay person. She said: “I’m a libertarian so I don’t think the state should have a role on who business owners serve. It is not often that I quote the Shadow Secretary of State for Wales favourably on this blog but his response to comments by a Plaid Cymru MP about the Welsh rugby captain are spot on. As the BBC report, Jonathan Edwards, who is Plaid Cymru MP for Carmarthen East and Dinefwr tweeted a question asking how Sam Warburton could captain the Wales rugby team if he considered himself British? Warburton's comment was made at a press conference where he was asked about the level of hostility between the Wales and England teams in advance of Sunday's clash at Twickenham. Asked to respond to England wing Jack Nowell's remark that "we're going out to play against a team that hate you", Warburton insisted: "We don't hate them". Warburton said: "Both my parents were born in England so I can't think that way at all. I think people make a bigger thing out of it. All the lads went on the Lions tour and got on well with the English boys. If someone asked me my nationality [on that tour] I'd say British." Mr Edwards, the Plaid Cymru MP for Carmarthen East & Dinefwr, tweeted: "I really find it difficult to understand how someone who does not consider themselves to be Welsh can be captain of the national rugby side." In a further tweet, the MP added: "Justin Tipuric is a far better player anyway." "And I equally condemn Plaid Cymru for daring to challenge Sam's role as captain of Wales in light of his feeling of belonging to both Wales and the wider UK. "I feel exactly as Sam does, as do millions of Welshmen and women in Wales and across the World. "And anyone who has seen Sam play, both as captain of Wales and as captain of the British Lions, can be in no doubt about the commitment and the passion with which he pulls on either shirt." There is no room in twenty first century Wales for the narrow-minded nationalism and politics of identity evidenced by Jonathan Edwards comments. Questioning the purity of somebody's Welshness is a slippery slope that no mainstream political party should want to step onto. It does not bode well either for Leanne Wood's plea today to voters of other parties to switch to Plaid Cymru in the forthcoming European elections. After all why would pro-European Liberal Democrats switch to a party that wants to isolate Wales and plunge us into a further economic depression by cuttng us off from the UK economy? This morning's Western Mail reports the continued 'cold fury' of the Welsh health minister at criticism of Wales' NHS from Westminster. Mark Drakeford has described the Conservative Party's criticism of the Welsh NHS as a “cynical” and “deliberate” attempt to “drag the reputation of the NHS in Wales through the mud”. There is no doubt that this dispute has got very heated over the last few days, but that does not disguise the fact that there are real problems on both side of the border that respective governments need to get to grips with. Nevertheless, one cannot get over the impression that Mr. Drakeford is protesting just a little bit too much. I have sat through many sessions in the Senedd when Welsh Labour Ministers have attacked the coalition government's record on health in England. Did they seriously not expect UK Ministers to reciprocate? A bad day for good news? Given the obsession of the Tory Party with immigration and their refusal to relax regulations where it is obvious that an economic advantage can be gained, I am not surprised by this story on the BBC which suggests that aa particularly inconvenient report has beeen suppressed. The BBC say that Downing Street has withheld publication of a cross-governmental report that suggests one potential impact of immigration is smaller than claimed. The work, an extension of that MAC research, estimates that the cost to existing British workers of new arrivals is much lower. However, the figure it suggests for the displacement of British workers has not been disclosed. Officials say the prime minister's team has prevented publication of the report, which has been ready since last year, to avoid igniting controversy. But Downing Street sources told the BBC the report had not yet been completed and was not ready to be released. They insisted it would be published "in due course", and the BBC's chief political correspondent Norman Smith says he understands this could be within days. Statistics released last week suggest the government is unlikely to meet its pledge to reduce net immigration to below 100,000 people a year by 2015. Vince Cable is no doubt feeling vindicated by this report. The Independent reports today that Nick Clegg has told the Liberal Democrats to prepare for another five years in power amid new evidence that voters are warming to the idea of coalition government. The findings are a boost for the Lib Dems. Last night, a bullish Mr Clegg announced that he is setting up a team to prepare for negotiations with other parties in the event of another hung parliament after next year’s general election. The Deputy Prime Minister insists he is not taking voters for granted but is increasingly confident his party will remain in office and that Britain is entering an era of coalition government. I was in Llandudno in 1981 when David Steel told representatives to go back to their constituencies and prepare for Government. It took 30 years to realise that dream. Let's hope that Nick Clegg does not repeat that mantra at the party conference this weekend. There is a lot of work to do to persuade voters to give Liberal Democrats the chance to return to government. Although we need to bee prepared for all eventualities we should not take get too confident yet..
Thursday's Guardian contains an admission that should make all Euro-sceptics pause before casting their vote in May's European elections. They quote the leader of the UK Independence party, Nigel Farage admitting on the eve of the European election campaign: "We're whistling in the wind if we think we can implement a Eurosceptic agenda from within the European parliament." He adds "we cannot change a thing in Europe" and that while Eurosceptics could "have some fun" in the European parliament trying to block legislation, it will "not last very long". As the paper says, Farage's forecast that sceptics will not be able to achieve anything in the European parliament after the elections raises questions as to the purpose of electing Ukip MEPs to the parliament, especially in view of the party's erratic voting record in the previous parliament. Liberal Democrat president, Tim Farron hits the nail on the head when he says: "Ukip MEPs don't turn up for key votes that affect British jobs, they don't work for their constituents and they don't stick up for Britain. More Ukip MEPs means fewer people working hard to protect Britain's interests in Europe. Our MEPs work hard all year round to protect British jobs." 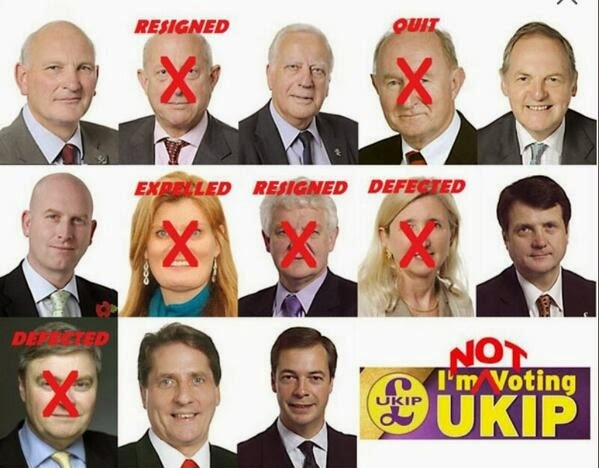 So, what is the point of UKIP? Are they really asking us to vote for them so they can go to Brussels, and draw substantial salaries and expenses just so they can have fun? I think we all know the answer to that. Whilst the Labour Party was busy changing its rules yesterday, it seemed that the media had other preoccupations. Indeed, a Labour own-goal completely over-shadowed any good news coming out of their special conference. Andy Sawford, shadow communities minister, has written to every MP with a local Waitrose asking them to press the chain to make changes to the scheme in the “spirit of fair competition”. Mr Sawford urged MPs of all parties to write to Mark Price, managing director of Waitrose to tell “him that his company is acting in a way that will further destroy the British high street”. Mr Price described Labour’s claimed as “nonsense” and said Mr Salford was “completely misguided”. As the paper says, up until now Waitrose has been held up by politicians from all parties as the model of good capitalism. Nick Clegg has even called for a fairer “John Lewis economy” in reference to Waitrose’s parent company, which is owned by its staff. However, Labour appears once more to have set its face against consumer choice and competition in an intervention that earns the title of the most bizarre of 2014 so far. Those who thought that the English badger cull could not get more farcical will have been disabused of that whimsy yesterday with the leaking of the conclusions of the Independent Expert Panel appointed by Defra to evaluate its implementation. First, fewer than half of the badger population was killed in both areas over the six-week period - against the target to kill 70% of badgers in each area. This is worse than preliminary assessments, which indicated that 58% of badgers had been killed in the Somerset area, and 30% in the Gloucestershire area. The IEP used a more precise methodology, accounting for the discrepancy in the figures. Research by Rosie Woodroffe of the Zoological Society of London carried out in the 1990s showed that if the target to kill 70% of badgers in six weeks was not achieved, the spread of bovine TB (BTB) - which the badger culls are intended to reduce - could actually be increased as infected badgers moved into new areas. The trial culls also failed to meet the principal humaneness criterion set by Defra, which is for no more than 5% of badgers to take more than five minutes to die. Depending on the assumptions made, the IEP found that between 6.4% and 18% of shot badgers exceeded the 5-minute time limit. It also found a "wide variation in the effectiveness and humaneness" of the contractors engaged to kill the badgers. Professor Woodroffe told the BBC's Phallab Ghosh that the panel's findings "show unequivocally that the culls were not effective and that they failed to meet the humaneness criteria. I hope this will lead to the Secretary of State (Owen Patterson) to focus on other ways of eradicating TB in cattle." The cull, she added, "has cost a fortune and probably contributed nothing in terms of disease control, which is really unfortunate." So the cull actually increased the incidence of bTB and proved to be a particularly cruel and inhumane way to kill badgers, many of which suffered despite Ministers' assurances to the contrary. What makes this farce even worse is that UK Ministers are ignoring all these findings and are determined to press on with the experiment. Whatever happened to evidence-based policy? After an initial hiccup Wales seems to have got it right. Would it really hurt for England to learn from us.